“Music is romance,” and romance was the theme of the night. The Enterprise Center had never been so dewy-eyed. Michael Bublé preached love and his goal for the night was to “make today Valentine’s Day.” He sang My Funny Valentine followed by I Only Have Eyes for You. Bublé sang from his soul, influencing the crowd to sway with the sounds and fall in love. Couples cuddled together and kissed. Some were even featured on the screen. Bublé expressed his love for St. Louis and the unique culture of the city. He described his experience while visiting the Galleria and his first time at The Cheesecake Factory, saying that he loved the food and people in STL. He compared his time in St. Louis to the trip he took to Florida joking that the people there were old and not very exciting. The comedy of the night was just as good as the music. Bublé said himself that he’s “got no filter.” When one hears the name Michael Bublé, the first thought that comes to mind is romance. However, the crowd was surprised with a concert and comedy show in one. In between songs, the jokes flowed and the crowd roared with laughter. Bublé poked fun of the fact that he was performing at The Enterprise Center. He said, “When I hear ‘romance,’ I think ‘hockey arena.’” Though probably the funniest thing he said all night was when he jokingly shouted “Thank you, good night!” less than an hour into the show. Bublé put an incredible amount of energy into his performance. He danced and spun around but never missed a single note. At one point, he joked that may have had a mini-stroke and “should’ve never made fun of the old people in Florida.” The energy he put off was reflected in the crowd. Things got really upbeat when lights came down from the ceiling and moved up and down to the music. He said he wanted to turn the arena into a jazz club and that’s exactly what he did. The people danced and clapped to the beat top the big band tunes. Bublé went on to tell everyone a little about his personal life and how much he loved and missed his grandpa. It was his Grandpa Mitch that introduced him to jazz and encouraged him to pursue music. He dedicated the song Up the Lazy River to his memory. After that, he sang Forever Now, moving him and the crowd to tears. The night was filled with laughter, and love. 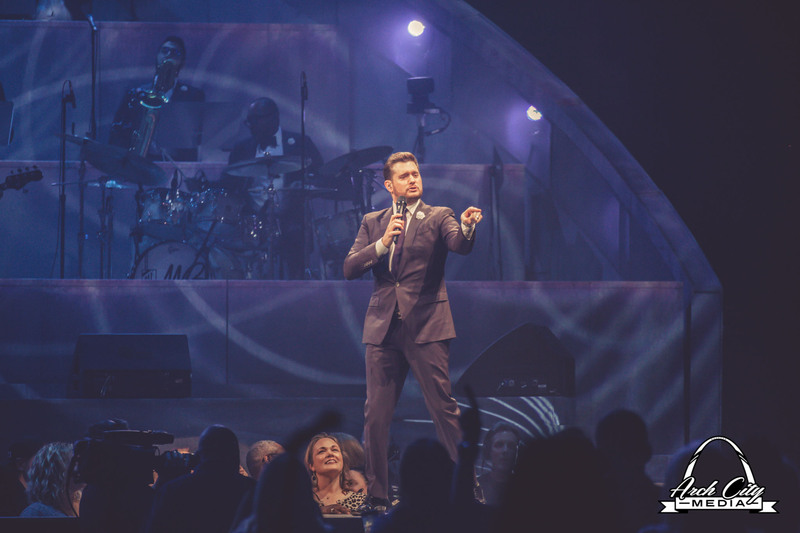 “All I want is joy in my life,” said Bublé, and he certainly brought joy to The Enterprise Center that night.